I was so excited when I spotted that this beauty has been launched in Pakistan. It is a Limited Edition means it will run OUT OF STOCK in a blink. I am a sucker for limited edition cosmetics particularly blushes and especially if its by Essence. So I rushed to an online Store and placed my order without wasting a single second because I did not want to regret later on missing out this beauty in my stash. Let's quickly get to the review. Way back then or right now, fashionista or bohemian queen: everybody wants a perfect complexion! The soft peach base colour of this multi colour blush ensures a fresh look while the flower decoration with golden shimmer creates gorgeous highlights to complete the bohemian look. This blush is part of Essence’s summer collection, so I’m sure it’s limited edition. 01 Its Popul-Art is the most gorgeous peachy/coral shade of blush with a beautiful pressed floral design. This blush has THREE shades, Besides the two shades you're seeing in the picture above, there is a third shade UNDER the ancient gold that is covering the pretty flower on the design. The ancient gold is very, very pigmented (very) but is only a thin layer decorating the blush, Underneath this Gold there is a pretty pink shade. I tried putting this on one morning and went "YACK!" when I saw how ORANGE and SPARKLY it made my face look. I'll need to apply this with a very, very light hand. The peach shade is matte orange shade and its pigmentation is avarage. The texture of this Blush is quite soft and it blends easily giving quite an amazing sheen. It easily stays intact on your face for good 4-5 hours. I am just loving this blush-on and would highly recommend this to everyone. I bought it for PKR 450 and its such a steal at this price. This blush have shelf life of 12 months. You get a ton of product that not only looks lovely in the pan, but adds a pretty peachy glow to your cheeks just in time for summer! This is a definite win! So, those were my thoughts on this sweet new blush. If you see it, grab it. 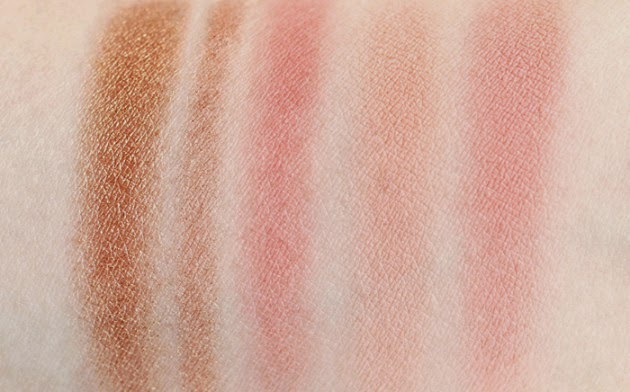 It’s gorgeous, and it’s beautiful to look at, even if you don’t like to wear peachy blushes!